1148-1453 The heart-rending fall of the Byzantine empire occurs four years after the accession of Constantine XI, brother of John VIII. Already by the death of John, Constantine would inherit a gutted carcass of the former empire. His jurisdiction stopped at the city gates and what was left of the once great heart of this empire inspired pity. Most of its Greek population had died out or fled, its great churches and landmarks long ago ruined and pillaged and its few remaining people destitute, hungry and demoralized. For his part Constantine was everything anyone could have asked for in a leader who knew full well, as well as everyone else, that the end was coming soon. He spent the greater part of his days as emperor preparing the city to hold out as best it could while helplessly watching the Sultan Mehmet II encircle the city and digging his heels in for history's greatest siege. When all pretensions of diplomatic resolutions were abandoned, when the last hopes of military help from the west faded, Constantine could but man the garrisons himself to promote the bravery of his men. All that stood between the Turks and the Christians now were the famed walls that had stood up to countless would-be invaders over the previous millenium. In the end however, the golden age of massive fortifications as bullwarks against besiegers was coming to a close with the introduction of firepower. Mehmet would introduce the hapless Byzantines to the business end of massive cannon that could punch holes in Constantinople's walls where before the greatest of catapult-hurled stones only bounced off harmlessly. Even then it took nearly two months of constant bombardment before they had been sufficiently weakened for Mehmet to consider a frontal assault. At long last, when the task was accomplished, the Sultan gathered his generals and gave orders to mobilize the armies to battle. As intelligence of the imminent onslaught reverberated throughout the city men, women and children stopped what they were doing and began a solemn procession across the city towards St. Sophia, its religious epicenter. Where before the poor complained of their state, the nobility of their burdens, and all others for their own reasons now they emerged suddenly in unison to profess their undying commitment to their emperor and their unshaking faith in Christ. With the realization that they were all doomed to the doubtful mercy of a savage and cruel tyrant all committed to pick up what weapons they had and stand their ground against the Turkish swarms. Constantine himself time and again refused to flee but chose to die a heroic death for his people. No sooner had the great mass concluded than all the city's church bells rang out the tolls of the approaching first wave. For the next five hours Mehmet sent countless regiments towards the broken walls. Each time they were slaughtered by the archers in the towers but the brute force strategy at last paid off and the outer, and then inner defensive walls began spilling the Turkish regulars who then pressed into hand-to-hand combat against the defenders. When all was lost Constantine himself disrobed the imperial regalia and went into the melee himself and was killed very soon after. And thus Constantinople fell on May 29, 1453. Coins minted under Constantine mostly served the purpose of paying emergency services, such as to the stonemasons who repaired the walls every night after Mehmet's artillery had done their work. There was very little, if any, need for currency during Constantinople's last years as what little aid in terms of food and other necessities trickled in from outside was in the form of gifts from sympathizers. This aid was distributed freely inasmuch as it was available. Coins of Constantine XI, therefore, are all exceedingly rare and of utterly crude craftsmanship. Engraving art, never a forte of Byzantine culture, was an unaffordable luxury in its last days. Unlisted SB, RN 96 (1991) AR Stavraton Obv: Nimbate bust of Christ. Rev: Nimbate bust of Constantine. Unlisted SB, DOC 1789, RN 124 (1991) AR Eighth of Stavraton Obv: IC XC - Nimbate bust of Christ. 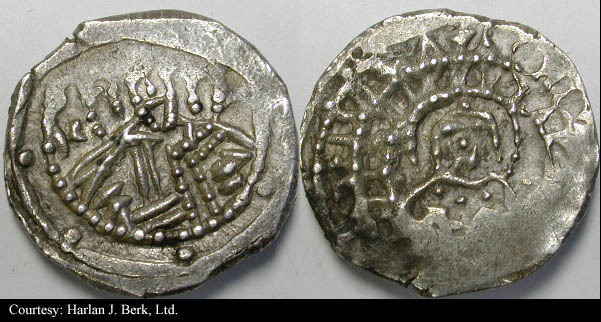 Rev: KTTN - Bust of Constantine; pellets above and below the letters. $2,900 9/19/01.